Send your stomach on an adventure. 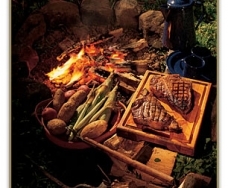 Our outdoor barbeques provide a not-to-be-missed culinary experience. From All-Natural Chicken Brochettes, Kurobuta Pork Spare Ribs with Huckleberry BBQ Sauce and Whole Roasted Pulled Carolina Style Pork, to simple, yet scrumptious classics like hot dogs and hamburgers, you won't walk away with an empty stomach.